1) It will take eons to change the dinosaurs that are the existing public education system, so why not create other ways to reach kids with these ideas in other time frames and in non-school settings? 2) Gosh I wish I could communicate my ideas this well. I'm going through a really painful process right now. 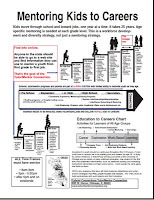 Since 1993 I've been reaching out to build a network connecting all sorts of people who are involved in some way, or should be involved, in helping kids in high poverty neighborhoods have mentor-rich, non-school support systems that well-organized, and well-funded, tutor/mentor programs might provide. 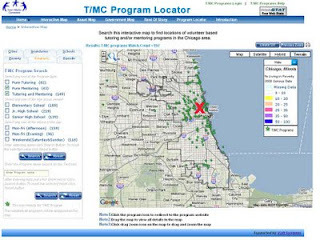 Since the Board of Directors at Cabrini Connections voted in April 2011 to discontinue support for the Tutor/Mentor Connection, effective June 30, I'm not only trying to figure out a new way to generate revenue to keep the T/MC going, I'm moving all of the T/MC history from the 4200 sq ft at our 800 W. Huron Office to much smaller space in my basement, a rented storage locker and donated office space. I've been keeping files showing every contact I've made over the past 18 years. My goal has been that I would find a researcher/writer who would use these files to show how myself and a few supporters have helped the T/MC network grow from year-to-year. Such information could inspire others who have no particular social standing or wealth to take on a similar role in other cities and other causes. I have donated network analysis software that could be used to map this network. Here's an article that illustrates how this software can map changes in a network. This article only shows a small group as a result of one event. 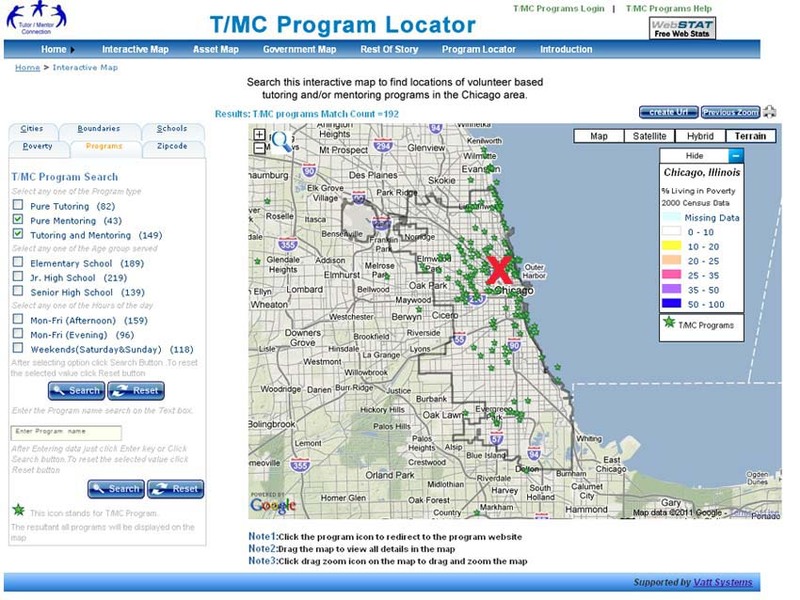 Imagine mapping the growth of the T/MC network, which formally started in 1992 with seven volunteers and a huge vision. However, with the impending move, I've had to start going through my files and library to choose between what I keep and put into storage and what I toss into the trash. I've already gone through the folders that I've aggregated about organizations in Chicago and tossed out about 8 boxes of files that don't directly relate to tutor/mentor programs in the region. Once in the trash I can never re-build that history or show those connections. Here's an example. I'm looking at a file with correspondence related to arts mentoring and an Art Festival we started at Cabrini Connections in 2000. One handout shows a program called FluidArts. Board members included Deborah Phelan and Bonnie Bracey. I'm still connected to Bonnie in other email. However the web site on the handouts does not work. This information show a goal of creating a global alliance. It's good stuff. People could still learn from this. Do I toss it? Caroline Kim at i Mentor (June 2001) - she wrote "I've been reading the messages you posted on various listserves, and I'm always impressed by your dedication and energy." Caroline and I are now connecting on Twitter and other social media platforms. Richard Civille, Center for Civic Networking, June 2001 - he wrote about The Creating Community Connections (C3) System saying "can you imagine how C3 can be further designed for community networks, community technology centers and other community based organizations to help them achieve their mission?" Robert Goetch, June 2001 - Robert was leading Students in Business, Inc at that time. he wrote "I am impressed with your web site. 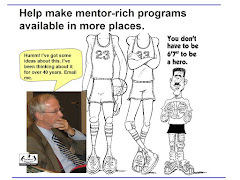 It seems to be a great resource for those implementing mentor projects." Robert and I are now connected in a LinkedIn group under his current Be A Mentor organization. Kevin McCann, Office of Educational Innovation and Evaluation, Kansas State University, June 2001. Kevin wrote "Yes, we should share ideas, perhaps we could collaborate." Cynthia White, Think Detroit.org, June 2001. Steve Roussos, a volunteer working with the T/MC wrote "I want to share some information with you about a project that Dan Bassill (from the Tutor/Mentor Connection) and I have been working on and may also be of interest to you and ThinkDetroit." These are just the first few pages of a thick folder! Over the years as I've met people on the Internet or in face-to-face meetings I've added them to our print newsletter mail list and to our email list. Unfortunately, we've not had money to send the print newsletter since 2004 and the growth of spammers has made it much, much, more difficult to build a connection via email. Yet, if I toss these records in the trash there will be no way in the future for me, or anyone else, to go back to these people to find out if the ideas we share are still being used or if there are now ways and/or reasons for us to be doing more to help each other. I have nearly 10 file cabinets of contact information, but need to cut this to half that size within two weeks. 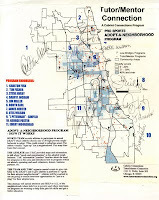 If someone has two-three rooms of office space to donate or if someone wants to move these records to a research institution who could partner with T/MC in building and sustaining this network, please call me at 312-492-9614. 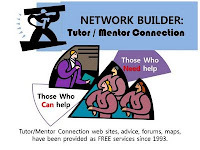 If someone wants to become the sponsor or benefactor of the Tutor/Mentor Connection that would be even better. You don't need to be from Chicago because these ideas apply to every major city in the world. The network I've been building for 30 years can be your network. Or it can go in the trash and be lost to all of us for ever. Thanks to Larry Ferlazzo for this post titled 'The Best Resources About Wealth and Income Inequality in America'. By leaving the Cabrini Connections program this summer I free up time to innovate new ways to help programs like this grow. I'm reading "A Brief History of the Corporation." This is one quote from the article: "Ideas fueled by energy can free up time which can then partly be used to create more ideas to free up more time." This week on the Social Edge Forum, Charles Cameron is leading a discussion about the changes taking place in organizations like Tutor/Mentor Connection. Join in and add your ideas. The map below shows the location where Cabrini Connections will be holding its 18th annual year-end dinner tonight. More than 250 guest are expected, including parents, volunteers, students, donors, alumni, etc. 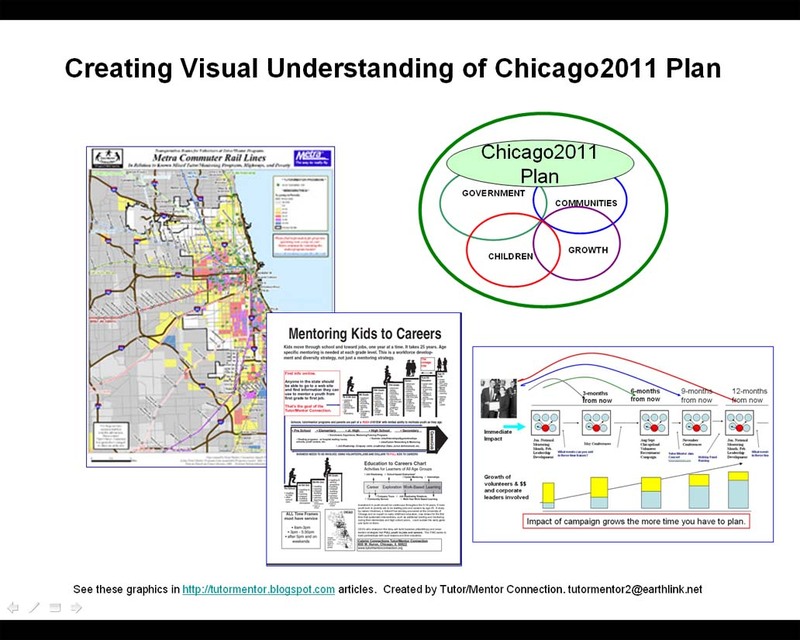 This slideshare shows images from the 2010 dinner. Visit the video section on the Cabrini Connections web site to see more like this. Where else will events like this be taking place this month, connecting people who don't live in poverty with kids and families who do? I've been leading this effort for 18 years and I'm leaving the organization next month because we've not been able to convey the benefits of tutor/mentor programs to enough philanthropic investors who will provide the on-going resources for programs to retain leaders for 10 and 20 years and build organizational knowledge that supports the growth of these programs. I'll not be leaving this mission even though Cabrini Connections and Tutor/Mentor Connection are separating into two different organizational structures. 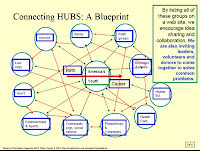 Through the T/MC I will continue to use this blog, networking, and the ideas and resources shared on the T/MC web site to help leaders in business, religion, politics, sports and media build a collective understanding of a tutor/mentor program as a place connecting a wide range of people and ideas in a long term effort to help kids move through school and into jobs and careers. I have not yet determined a structure for the future Tutor/Mentor Connection. I could become an institute within a university. I could become an independent think tank. I could become a consultant and charge fees for the ideas I've been giving away for free. Or I could create a non profit and try to compete for donor attention with the same frustration I've had for the past 18 years. I hope you'll help me make the right decision and support me in this effort for the next decade. 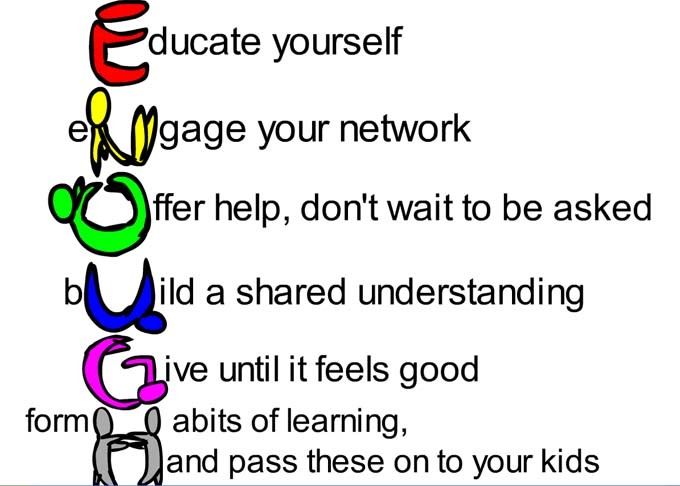 I also hope some of you will become partners and owners so you carry these ideas forward when I'm no longer able. It's been an honor and an ever-day reward to be part of Cabrini Connections and the Montgomery Ward/Cabrini-Green Tutoring Program that came before it. I hope we can help millions of others get involved with this journey so they can share the same rewards. I've been thinking about this for a long time. Now this Hot to Profit from Your Blog article showed up on Facebook. I'm posting it here to share with others and so I can come back and dig deeper into how this gets done. 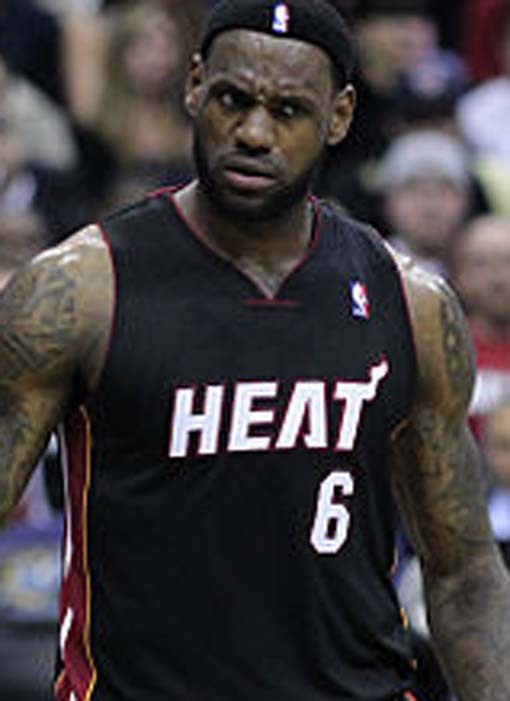 After a bad game wouldn't it be great if LeBron had something else to talk to reporters about? This video was created by one of our interns. It suggests athletes could be advocates for tutor/mentor programs in different parts of the city where they play. This second video shows that they could be doing this strategically, and talking about how they support tutor/mentor programs when the microphone is in their face, rather than talking about the "bad game" that just ended. This pdf and this series of blog articles were the original material used to inspire the creation of these videos. These videos illustrate ways students in high school and colleges throughout the country could be creating training/motivational entertainment that might get the attention of athletes like LeBron and recruit them to take this role. The result might be that athletes from every sport in a city were adopting different neighborhoods, and talking about ALL of the tutor/mentor programs in these neighborhoods and the way fans can support them as volunteers and donors. Wouldn't that be more fun that talking about a bad game? All we need to make this a reality is for a few athletes to come forward as sponsors and partners, so new videos could be made with them as spokespersons. I came across "info-graphics" in some Twitter searches today. These are visualizations of information. If you do this search you can skim the posts and go to various graphics about different topics. This one is a visualization of the "opportunity gap" between rich and poor in America. I'd like to harness this to illustrate Tutor/Mentor Connection concepts. Anyone able to help? Earlier today I posted an article titled YouthMobs: Let's Talk About it. The headline was borrowed from a column by Richard Roeper from today's Chicago SunTimes. 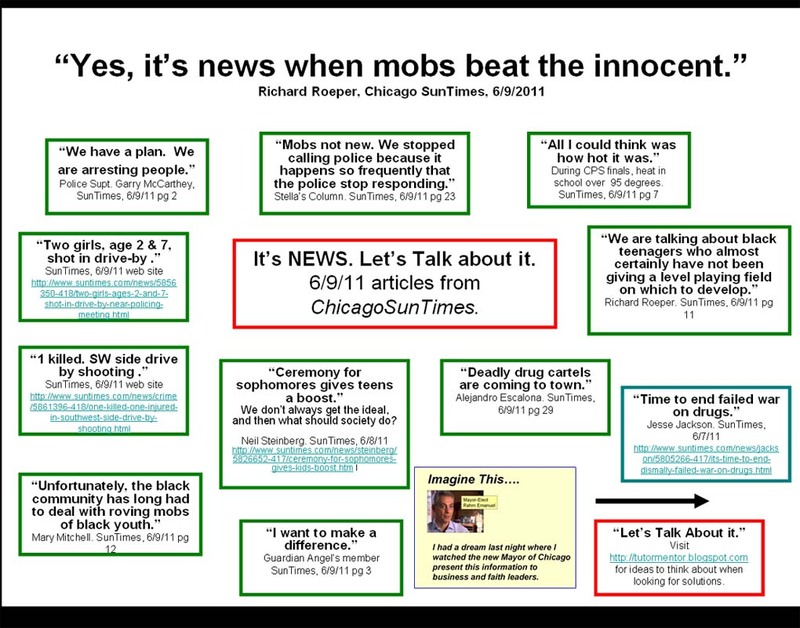 Below is a media map showing other articles in the SunTimes related to this story. 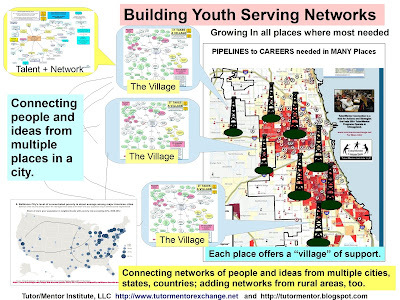 Since 1993 I've been creating map-stories following negative news, with the goal of enlarging the number of people who were doing serious thinking about ways to build a better distribution of non-school tutoring, mentoring, learning, career-development and enrichment activities for k-12 youth living in high poverty areas. 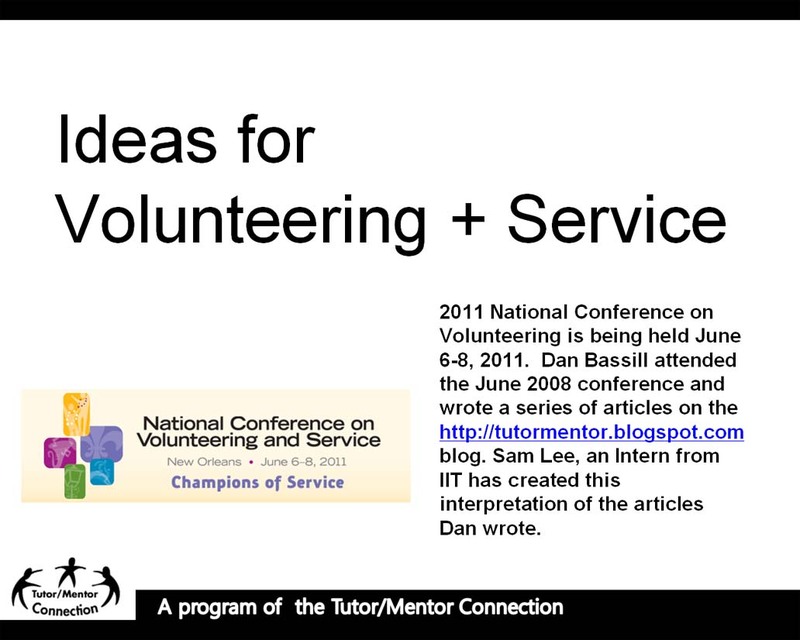 The articles I post are the result of leading a volunteer-based tutor/mentor program since 1975. That's over 35 years! 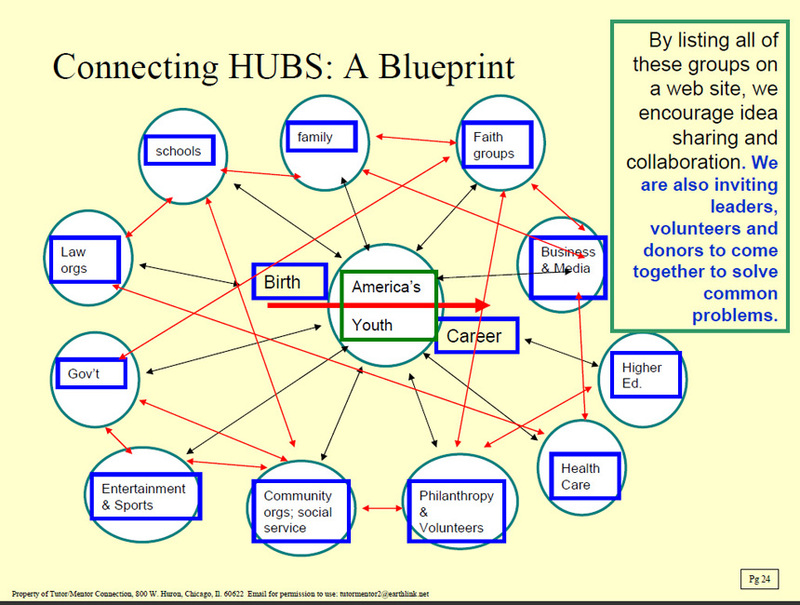 Few people in the country have had to think of ways to connect youth and volunteers...and find donors and other support resources...for this many years! During my first 17 years I held retail advertising jobs with the Montgomery Ward Corporation. From 1980-1990 I held different roles responsible for creative development of all print retail ads, or for building the annual advertising calendar that we used to draw customers to over 400 stores in 40 states. I learned the power of central office planning and mass communications. By 1980 our tutor/mentor program at Wards had 200 pairs of youth and volunteers with no paid staff. I and others were the manpower leading this program. With a demanding job I had to find innovative ways to support our volunteers. Thus I borrowed from the mass communications strategies of Wards and other retailers to send print newsletters to our volunteers each week, pointing to information they could use to help them with their weekly tutoring/mentoring. While my technology was a typewriter and duplicating machine in 1975-80 it became a Mac and PC in the 1980s along with a copy-machine. By the 1990s it became email and a web site. The goal has not changed. As people are looking for information to show them what they can do we were collecting and hosting information that any of our volunteers and leaders could use to support their own involvement. 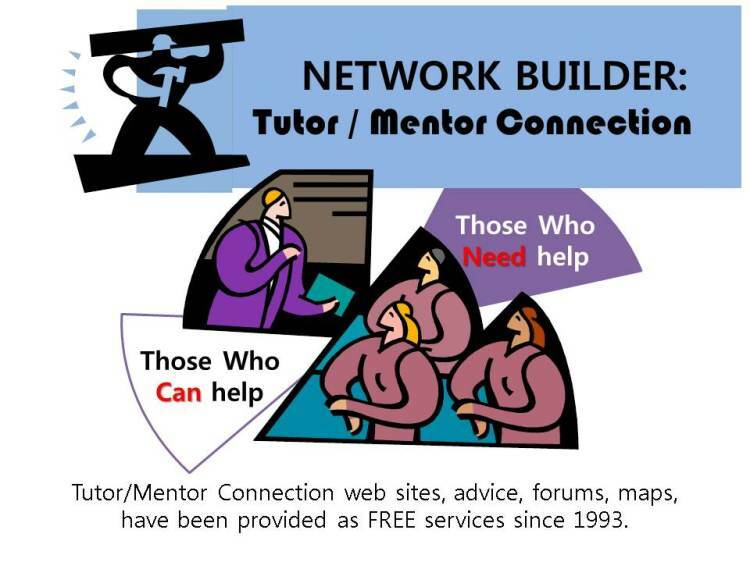 When we started the Tutor/Mentor Connection in 1993 we expanded on this. We built a database of more than 200 youth serving organizations in Chicago and thousands of potential supporters in Chicago and around the country. We began hosting this on the internet. At Wards I had a $250 million budget to draw customers to our stores. In the T/MC I've never had an ad budget. We had a pro bono Public Relations firm help us for several years. However PR and media stories are not advertising. They don't have the reach and frequency to get customer attention and convert them to shoppers. Thus we begin to follow negative news stories, such as the Youth Mob stories that are getting top media attention this week. When people are reading these stories the media are not pointing them to places where they can learn more about what they can do to build systems of support that might give youth better options. We are. Browse the articles on this blog and the related links. Form a learning circle in your church, mosque, synagogue, college, business or political circle. Start learning from this information and begin to take on some of the leadership roles describe in this section of our web site. As you know more, and do more, share your own strategies and work with us to get even more people involved. When the Mayor says "Chicago won’t move forward unless we all work to move forward together." we need to respond by learning where and how we can be involved, then acting every day in one way or another until the problems are solved. This is not a short term solution, but if it has been supported since 1993 when we first began suggesting this way of working together to help inner city youth have more opportunities, we might be a lot further along now than we are. 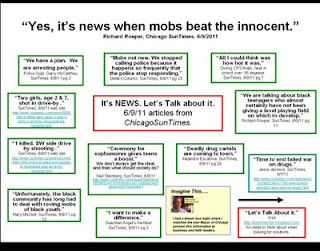 Richard Roeper's 6/9/2011 Chicago SunTimes column is titled "Yes, it’s news when mobs beat the innocent" He wrote, "The dominant conversation in Chicago these days isn’t about a New York congressman sending pictures of his maleness to women. It’s people telling each other to be alert and to be careful, even when in they’re in the nicest neighborhoods in the light of day." So, if we're talking about it, how about talking about solutions? 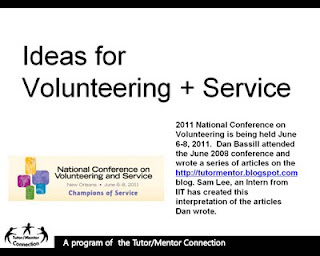 The National Conference on Volunteering and Service was held this week. I attended in 2008 and wrote a series of blog articles following, that call on leaders to be more strategic in using volunteer resources to help solve community problems. This week Sam Lee, a student intern from Korea, created a summary of my articles. This graphic is from the first page. View the her presentation here. Since this is NEWS, I encourage you to set up a discussion group in your church, business, college and political network. 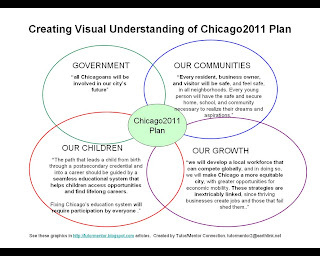 How can the ideas we share here become part of the Mayor's Chicago2011 Plan? 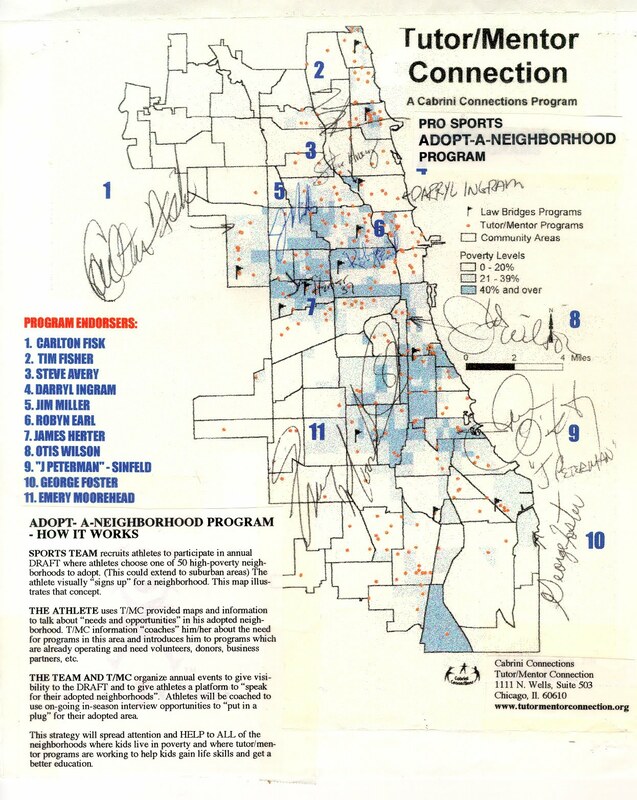 What might be different today if Mayor Daley had began to adopt these ideas 20 years ago when I first began to share them with him and his staff? I've been writing about Mayor Emanuel's Transformation plan in a series of articles. Chicago can only succeed as a city if every part of Chicago succeeds. Chicago won’t move forward unless we all work to move forward together. Success will be measured by asking whether all of our communities are thriving. These plans are highly interdependent. For how can we even begin to think about the way our government should be structured and run without deep consideration of the supports that communities need and the best way to deliver those services? How can we grow without strong communities? How can we ponder what is best for our communities without thinking hard about the challenges our children face? I've written about complex problems and visualization often in the past and I feel this plan needs some visualization to help people understand it. So I've created this graphic to illustrate how the four parts of the Transformation plan are interconnected. I've spent over 30 years thinking about some of the issues the new Mayor seeks to address. Thus, I'd like to be able to contribute to the planning. The graphic below illustrates some of the ideas we offer. All of the articles on this blog and in the Tutor/Mentor Institute represent ideas and strategies that need to be further developed and funded. If you can help us find investors or connect with people in government who might fund us as a consultant we can continue to develop and share these concepts. 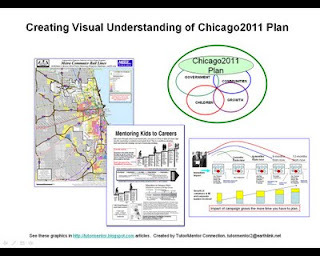 Call 312-492-9614 or email tutormentor 2 at earthlink dot net to set up a meeting where we can begin to show you what these graphics mean and how you can apply them to your own learning, planning and leadership. I was one of the judges in the SAGE USA Tournament held at UIC on May 27 and 28. This competition encourages young people to develop business ideas that earn sustainable revenue and contribute to social well-being. Fellow judge Rieva Lesonsky wrote this account of the event. We've been encouraging young people to innovate new ways to share T/MC ideas and attract a more consistent flow of volunteers and donors to social benefit organizations helping inner city kids. See the work they do on this Intern blog. 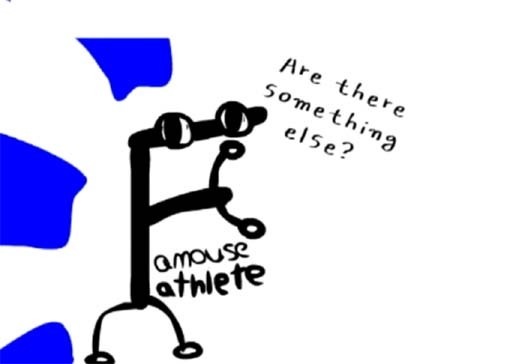 This cartoon graphic is from a new project posted on YouTube yesterday. It's goal is to coach athletes on roles they can take on a consistent basis to draw attention and resources to tutor/mentor programs throughout the city where they are famous.